If you’re looking for one way that the National Football League has changed since, say the start of the century, you don’t have to go much further than looking at how running backs are being used. In simple terms, NFL teams are looking for ways to get the ball into the hands of their fleet-footed runners. No longer is the game limited to handing the ball off to the best runner and letting him find a way up the field. These days, passing the ball to your running back is just as important as the quarterback handing the ball off to his runners. Let’s quantify this… using 250 or more rushing attempts and 50 receptions in a season as the yardstick, we see that in NFL history there have been 109 occasions when a running back had 250-plus rushing attempts and 50-plus receptions in the same season. Fifty-one different running backs have accomplished this feat in NFL history. Last season two players met these numbers: Baltimore’s Ray Rice, who carried the ball 257 times to go along with his 61 catches, and Cleveland rookie Trent Richardson, who had 267 rushing attempts to go along with 51 receptions. Following are the running backs that have had the most seasons with 250+ carries and 50+ receptions. * Four players accomplished this feat while in their 30’s: Tiki Barber (2006, 2007 at age 30 and 31), Ricky Watters (2000 at age 31), Tony Dorsett (1984 at age 30) and Priest Holmes (2003 at age 30). 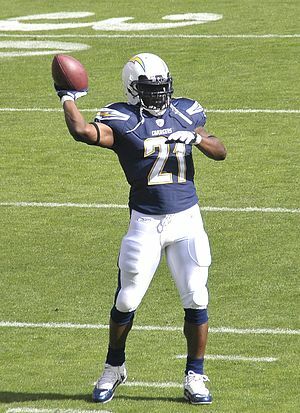 * LaDainian Tomlinson holds the record for most consecutive seasons with 250-plus rushing attempts and 50-plus receptions with eight. He did it from 2001-2008. Tiki Barber did it in five straight seasons from 2002-2006. * Nine players reached the 250/50 milestone in their rookie season, including this year’s rookie to make the list, the Browns’ Trent Richardson. The others were: Billy Sims (1980), Joe Cribbs (1980), Eric Dickerson (1983), Marshall Faulk (1994), Edgerrin James (1999), LaDainian Tomlinson (2001), Steve Slaton (2008) and Matt Forte (2008). * Two players in NFL history not only had 250 carries and 50 catches, but also had at least one kickoff return and one punt return in that season. Joe Cribbs did it in 1980, Maurice Jones-Drew did it in 2009.